Open Source – Massive community of support. Flexible – As complex as you need. Integrates with ease. Intuitive – Empower your users to make content. Infinite Editing for smoother work flows. Language Variants to add new languages in minutes. Content apps to gather meaningful data about your content. 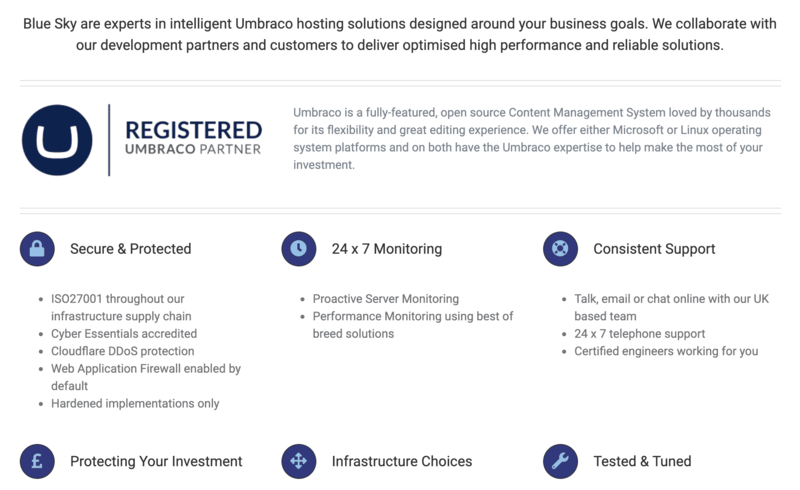 Why Choose Blue Sky for Umbraco Hosting? Flexible – Much the same as Umbraco itself, our team and solutions work alongside you. Certified – Umbraco registered partner, ISO 9001/ISO 27001, Cyber Essentials and Microsoft Partners. Expertise – Benefit from our team’s knowledge and deliver the results you need.